After a disturbing video captured California deputies savagely attacking a woman for selling flowers without a permit surfaced, a lawsuit was announced. Perris, CA — In the Land of the Free, if you do not pay the State before you attempt to sell a product or service to a willing customer, you can and will be extorted, kidnapped and caged, with extreme prejudice. 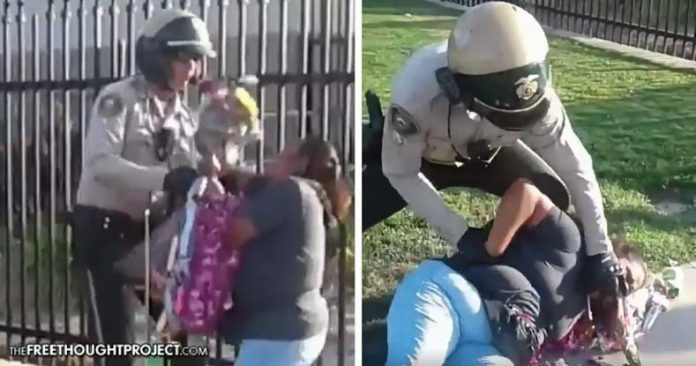 A video published to Facebook backs up this notion, showing a Riverside County Sheriff’s Department deputy assault a woman who was selling flowers on the side of the road — because she apparently failed to pay the State for the privilege. Now, because the deputy’s actions were so egregious, the taxpayers are going to be held liable. The victim, Joaquina Valencia, was selling flowers outside of a high school graduation ceremony in Perris last year when the altercation began. Because she was treated like a dog and savagely attacked, Valencia announced a lawsuit this week against the department. Valencia says in the lawsuit that no human should ever be treated the way she was. “He tossed me like a rag,” Valencia said in an interview with NBC Los Angeles. The video does not tell the entire story. However, it starts as the officer is grabbing a woman who is holding multiple sets of flowers, clearly arranged for sale on the roadside. As the video begins, the motorcycle officer is grabbing the woman by the arm. The woman, who apparently doesn’t speak English, is clearly terrified. Not wanting to be assaulted or otherwise extorted by the deputy for selling flowers, the woman pulled her arm back and tried to move away. She was still holding onto her flowers, indicating that she was in no way a threat to the officer. However, as the woman attempted to move backward, away from the officer, he grabbed her by her hair and attacked her. Within seconds, the officer had tripped Valencia — who was still trying to protect her flowers as they likely cost her much needed money — and was on top of her. The video is appalling as the cop kneels down on the woman and shoves his gloved hand over her mouth. The woman begins yelling out in Spanish as another cop joins in on the arrest — all over flowers. As the officers roll her over to place the handcuffs on her, we can see just how terrified Valencia is, as she appears to have urinated on herself. The department justified the arrest, claiming that Valencia gave a fake name (Juanita Mendez-Medrano) when she was detained. However, this had nothing to do with the original stop for selling flowers. And, all charges were eventually dropped against Valencia. Moreover, Valencia’s attorney Ralph Rios argues that Joaquina Valencia is her true name and that she was just nervous. “A lot of times when people do that, people get nervous and, she might have said a different name, she might have said something,” Rios said. Some of the comments on the video are almost as disheartening as the video itself. Multiple people attempted to justify this assault and battery by claiming the woman should’ve had a permit. taxes, it;s called getting a permit, pay taxes, oh and dont resist when officer gives you a ticket. Is that person even in the country legally? Selling flowers without a vendor’s license is a crime. Petty but crime non the less. So is resisting arrest. Sadly, Americans are being conditioned to think that in the land of the free, people are somehow morally wrong if they try to make a dollar without first being extorted by the state. The bottom line is — in modern day police state, USA — exchanging goods and services is a crime unless the State gets their cut. We are told that this is for our safety and that we could all die if a brown woman sells flowers on the corner. But nothing could be further from the truth. Morality does not equal reality — and the video below is more than enough evidence to prove this. In May of last year, the Alameda County Sheriff’s department posted a photo of a deputy arresting a man for selling fruits and vegetables on the roadside and attempted to justify the arrest. When people read the department’s justification, they lashed out — peacefully — to let them know what they were doing is wrong. The following June, a 38-year-old homeless man was attempting to earn some honest money by providing a much-desired service to the residents of Kennewick, Washington when he was threatened with extortion and arrest by the local police department, which effectively ended his enterprise. After the Kennewick Police Department threatened the homeless man and prevented him from making a living, they took to Facebook to shamelessly brag about it.